CSLR welcomes several visiting professors over the course of this academic year. 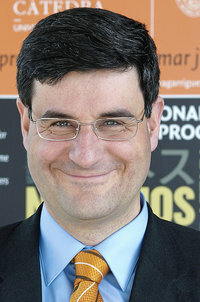 Rafael Domingo, former dean of the University of Navarra Law School, will be in residence during 2013 working on issues of Catholicism and jurisprudence. Michael Welker, professor of systematic theology at the University of Heidelberg, will arrive in March and spend several months working with CSLR Director John Witte, Jr. on developing a new project on Christian Jurisprudence. Patrick Parkinson, a family law scholar and professor of law at the University of Sydney, will join us in the spring and work with Barbara Woodhouse, L.Q.C. Lamar Professor of Law. This fall, Seyed Noori, former faculty member of the Department of Law, Mofid University (Qom, Iran), has joined the Emory Community in our neighboring Center for International and Comparative Law and will be co-teaching and developing a comparative law course with Abdullahi An-Na’im, Charles Howard Candler Professor of Law.